Please Don't Be One Of Those Rude Drivers Nobody Likes! Being one of those rude drivers in the traffic commute, can have fatal consequences, and that is why we regard this article to all drivers who have witnessed a situation where their neighbor was showing childish behavior. We must mention that we have objectively analyzed this video, and from the footage that is shown, according to us the both drivers are somehow guilty, as they are shooting a video while driving. However here is the short story from the driver that shot this video. 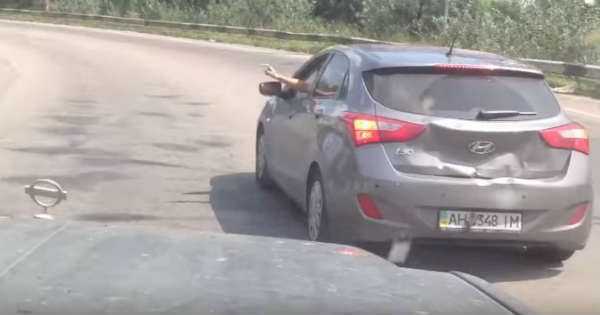 So, the young representative of the rude druvers of the Hyundai i30 has started provoking the camera man way before the video was shot, by recklessly changing the roads, embedding in front of him and compressing. That way he did not let any pass, which resulted with even more frustration by the driver who shot this video. By passing the young adults, we can see the degree of their aggressiveness, as the passenger girl shows meaningful gestures that literally have crossed all moral boundaries. That is the reason, why the camera man punished the young couple with a slight hit in the back of their Hyundai i30. Of course we do not support that step, but as we found out, the police was informed for the whole situation, and the driver was advised to go to the nearest police station and write a statement describing the events. That is what he had done. We have no idea of what happened next to this traffic drama, but if you ever found yourself in a similar situation, we advise you to do the same -- call the police and ask for their guidance. Rude drivers must get it! If you want to see which states have the rudest drivers, read this interesting survey.